You can create a slideshow on Facebook to share your memorable events. You can even jazz up the video by adding title and music themes. When you have something special to share with your friends on Facebook, you post a photo. Why not try something different? You can create a slideshow on Facebook by stitching together photos, but what I like about this feature is that you can choose different themes with a matched soundtrack and add a title to the video to describe it. It is available on Android and iOS, but not on the web version (at least for now). Open the Facebook app and tap status update from the top of News Feed or your timeline. Select Slideshow from the list by scrolling down. Select the photos you need to add by tapping ADD PHOTOS in the PHOTO tab. When you select three photos, Next will be shown in the top-right. Tap that to go to the editing place. You can tag your friends by tapping the tag icon in the top-right. Select one out of the different themes available from the MUSIC tab. You can even add a title by going to the TITLE tab. When you are done, tap Next in the top-right. 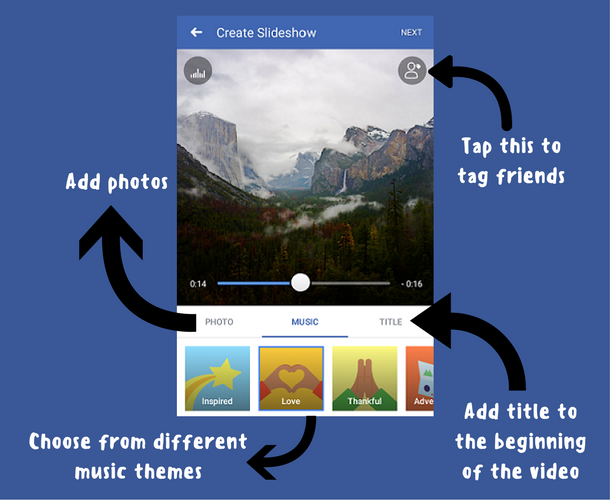 Spice up your Facebook slideshow by adding music and title. Facebook will create a video out of your edits and then you can share the Slideshow with your friends. Happy sharing your favorite moments! There is no "slideshow" option and I just updated my Facebook app on my Iphone.